At number 23 in Rolling Stone Magazine’s list of the 100 greatest Beatles songs is “Abbey Road Medley”. This refers to the sequence of songs which merge into each other on the second side of their album Abbey Road. The second side of Abbey Road opens with “Here Comes the Sun”, then “Because”, and this is followed by the medley. There are 8 songs in the medley, in order they are “You Never Give Me Your Money” (McCartney), “Sun King” (Lennon), “Mean Mr. Mustard” (Lennon), “Polythene Pam” (Lennon), “She Came in Through the Bathroom Window” (McCartney), “Golden Slumbers” (McCartney), “Carry That Weight” (McCartney) and “The End” (McCartney). There is no conceptual link between the songs, rather they just merge into each other, culminating in “The End”, with McCartney’s unforgettable lines “And / in the end / the love you take / Is equal to / the love you make”. At number 23 in Rolling Stone Magazine’s list of the 100 greatest Beatles songs is “Abbey Road Medley”. Most of the songs in the medley do not seem to be available on YouTube, but I have found this video of the last 3, namely “Golden Slumbers”, “Carry That Weight” and “The End”. And, here is the video of these three wonderful songs. Enjoy! So, let me explain why surface brightness is constant for nearby galaxies but not for more distant ones. First of all, however, I will explain what surface brightness actually is. When I started my PhD in Cardiff, the research group which I joined was probably best known for work on something called surface brightness selection effects. I won’t go into the details of what this means, but I will explain what the concept of surface brightness means in astronomy. Apart from stars, pretty much everything else in astronomy is an extended object, which means that it covers an area on the sky. This is particularly true of nebulae, which include emission and reflection nebulae, but also galaxies (which used to be called ‘nebulae’ before it was realised that they were outside of the Milky Way, see my blog here for more about that). So, for example, the Andromeda galaxy has an apparent visual (V-band) magnitude of 3.44, which should render it easily visible. But it is not, as this magnitude is spread over an area which is about 6 times larger than the Moon. It is the fact that the light is spread out over such a large area which renders the Andromeda galaxy so difficult to see to the naked eye. How bright (luminous) an object appears to be decreases with distance; it goes as the square of the distance, so an object three times further away appears nine times less luminous. But, the luminosity per unit area, which we call the surface brightness, is constant with distance. Let me explain why. As an object moves further away an area of e.g. 1 arc-second squared on the object will encompass more of the object. Let us suppose that some galaxy is initially at 10 Mega parsecs, and 1 square arc-second on the object encompasses an area where there are 10 million stars. The surface brightness we measure will be due to the light from these 10 million stars, as seen from our distance of 10 Mega parsecs away. If we now move the same galaxy to twice the distance, 20 Mega parsecs, and we assume that the distribution of stars is uniform across the galaxy (a simplification which is not generally true), then the light from each star is reduced by a factor of four. But, now our 1 square arc-second encompasses a larger area of the galaxy. In fact, whereas before we said there were 10 million stars in our one square arc-second, when we move it to twice as far away there will now be 40 million stars in our 1 square arc-second, because the area on the galaxy goes up to four times as large as previously. So, even though the brightness of each star is reduced by a factor of four, we have four times as many stars in our 1 square arc-second, and so the two effects compensate and we have a constant surface brightness with distance. where is the integrated magnitude of the object over an area of square arc-seconds. Richard Tolman was a mathematical physicist who worked at Caltech, and he is mentioned in my book The Cosmic Microwave Background (click here for more information) for being the first person to show that a blackbody spectrum retains its characteristic shape in an expanding Universe. He also devised a number of tests to determine whether the Universe was expanding or not. One of these (which he suggested in 1930) predicted that the surface brightness of a galaxy would not be constant with distance if the Universe were expanding. I will explain why below. Let me explain each of these in more detail. Let us assume that, in a static Universe, a galaxy is emitting a certain number of photons every second in some astronomical passband, such as the B-band filter (see my blog here about astronomical filters). Our detector (a camera) detects, let us say, a million of these photons each second. Of course the galaxy is emitting a lot more photons than this, as we are only intercepting a tiny fraction of the emitted photons with our telescope, and no telescope or detector is 100% efficient. But, at our detector, we record 1 million photons each second through our filter in this static Universe. Now, let us consider exactly the same galaxy but in an expanding Universe. Because of the expansion, each second which lapses means that the galaxy we are observing is slightly further away than it was the second before. The photons have a further distance to travel as time passes, due to the expansion of the Universe. As a consequence, the number of photons we detect is not going to stay constant, it is going to go down. Not only will the number of photons arriving each second go down due to the expansion, but the wavelength of each photon arriving will be longer, due to the cosmological redshift. As space expands each photon’s wavelength gets stretched, this is why we refer to the redshift of distant objects, their light gets shifted to the red end of the spectrum. This also leads to the light from stars being shifted into a longer wavelength pass-band. This would not matter if the light from galaxies were spread equally across wavelengths, but it is not. So, for example, if a particular galaxy’s spectrum peaks in the blue part of the spectrum in its rest frame, this peak will shift to e.g. the V-band or R-band due to the stretching of the wavelength of each photon, so the light seen in the B-band will be reduced, and hence the surface brightness measured in the B-band will also be reduced. where, again, is the transverse comoving distance. So, as we can see, the surface brightness depends on redshift in the sense that it is proportional to , a very strong dependence on redshift. For small redshift, , this reduces to what we stated at first, that surface brightness is independent of distance. Despite a stutter with about 20 minutes to go, England succeeded in beating France and winning the Grand Slam. Wales thrashed Italy, and Ireland beat a resurgent Scotland in the final weekend of the 2016 6 Nations. Wales needed to make amends for their terrible first half performance against England in Twickenham last week, and in many respects they did. They beat Italy 67-14, running in nine tries and scoring their highest ever points tally in a 6 Nations match. Whereas it took Wales 60 minutes to wake up last week, against Italy they were dominant from the start and showed the kind of attacking flair which fans are so desperate to see in other matches. Why Wales cannot move the ball wide with such skill and speed against better opposition is something I don’t fully understand. Each time they went wide they looked dangerous, and yet against better opposition Wales play a narrow game and the wingers rarely see the ball. With a daunting three-test tour of New Zealand coming up in June, and a “friendly” against England at Twickenham at the end of May, surely this next few months is the time to try and add some variety to the Warren-ball game plan which has become all too predictable. I fully expect Wales will be taught a rugby-playing lesson by the All Blacks in June, which will once again show the massive gulf between us and the best in the World. So, why not try something different and see if we can move the ball wide as much as possible; we have nothing to lose as we are going to lose anyway! Scotland continue their revival by giving Ireland a run for their money in Dublin. Although Ireland won 35-25, Scotland were more than decent opposition and had their chances to have made this match even closer. Until Scotland had a player sin-binned deep into the second half, they genuinely looked like they could win this pulsating match. I am so pleased to see this long-awaited revival of Scottish fortunes, it has been too long since they were a decent team and hopefully they are on their way back to where they were 20-odd years ago. You never know where you are with France, and this match proved that cliché as much as any I’ve seen. After looking abject throughout most of this 6 Nations, France put in a performance which rattled England. In fact, if they had not had so many of their line outs stolen, France could have won this match. Going in to the last quarter England were 25-21 up and France looked the better team. But, thanks to some superb line out work by England’s two second rows, les Bleus lost too much vital possession and field position, and England held on to win their first Grand Slam since 2003. Although I was hoping for an upset in Paris, as of course I wanted to see England fail at the final hurdle as they have done 5 times in the last 20 years, I do have to say that they thoroughly deserved to win this year’s 6 Nations. True, Wales could have beaten them if the game had continued another 5 minutes, but had we done so it would not have been a fair reflection of England’s dominance in the match. Yesterday’s match in Paris was, in fact, a much closer affair, despite what the scoreline says. At no point did England look particularly dominant, and a more confident France could well have given the upset so many of us non-English wanted to see. As has now become customary, the Northern Hemisphere countries will now trek south in June to take on the Southern Hemisphere countries. Wales go to New Zealand, England to Australia and Ireland to South Africa. Scotland go to Japan, which is not the easy tour that it used to be. I fully expect Wales to lose 3-0 in their test series; which is not being pessimistic, just realistic. England could well give Australia a tough series; they have certainly been the team who have improved most since their terrible display in the World Cup. Ireland have been strange; two decent performances, a reasonable performance against Wales, but two terrible performances against England and France. It will be interesting to see how they get on in South Africa. Most teams seem to now look upon the period after a World Cup as a time to rebuild, and I sincerely hope that Wales’ rebuilding includes adopting a more adventurous game plan, we certainly need it. We have gone backwards in the last 3 years; it is time for a rethink amongst the Welsh management. 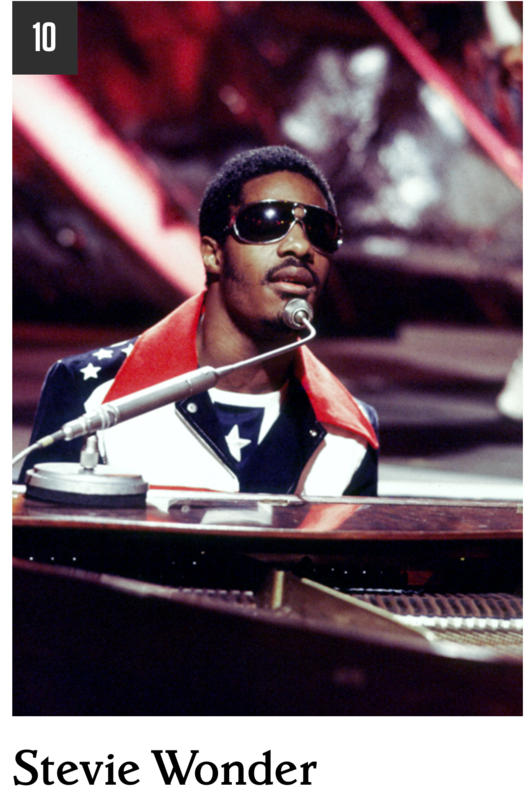 At number 10 in Rolling Stone Magazine’s list of the 100 greatest songwriters is Stevie Wonder. Stevie Wonder was born Stevland Hardaway Judkins and, when he burst on to the musical scene in 1962, he was initially known as Little Stevie Wonder. He was hailed as a child musical genius, composing his first songs at the age of 11. Of course, the ‘little’ was dropped as he grew older; but in a career that has spanned six decades he will certainly go down as one of the most important singer-songwriters in 20th Century music. Some of his best known songs are ‘Uptight (Everything’s Alright)’, ‘The Tears Of a Clown’ (a number one hit for Smokey Robinson and the Miracles), ‘Isn’t She Lovely’ (a song to his new-born daughter), ‘For Once in My Life’, ‘Sir Duke’, ‘Lately’ (which I blogged about here), and ‘Happy Birthday’, the song he wrote in the campaign to have Martin Luther King’s birthday recognised as a public holiday in the USA (which I blogged about here). His 1976 album Songs in the Key of Life is considered one of the greatest albums of all time. At number 10 in Rolling Stone Magazine’s list of the 100 greatest songwriters of all time is Stevie Wonder. The song which I’ve decided to include in this blog is ‘Sir Duke’, which was released as a single in 1977 and is possibly the first Stevie Wonder song I remember hearing on the radio. It comes from his album Songs in the Key of Life, and when released it got to number 1 in the USA and to number 2 in the Disunited Kingdom. Which is your favourite Stevie Wonder song? Just over a week ago, on March 3, the news broke that the Hubble Space Telescope has found the most distant galaxy seen to date, GN-z11. At a spectroscopically measured redshift of z=11.1, it breaks the previous record of z=10.7 (which is a redshift currently based on the photometric redshift method, rather than spectroscopy). The previous record for a galaxy which had been spectroscopically measured was z=8.68, so this new discovery breaks that record by some margin. Here is an image of the galaxy. It is superimposed on an image of a survey called GOODS North to show the part of the sky where the galaxy was found. An image of the most distant galaxy seen so far, at a redshift of z=11.1; meaning we are seeing it as it was when the Universe was only some 400 million years old. Here is a screen capture of the summary of the Space Telescope Science Institute’s press release, you can find the actual press release here. A screen capture of the summary of the press release announcing the discovery of a galaxy at a redshift of z=11.1, which has been measured by spectroscopy rather than based on the photometric redshift technique. You can see in the text of this press release summary that the galaxy is referred to as “surprisingly bright”, and below I show the beginning of the preprint of the paper announcing the result (dated March 3). You can read the preprint for yourself by following this link. Again, the galaxy is referred to as “remarkably luminous” in the preprint. Today I just wanted to present this exciting story, but next week I will explain more about a “schoolboy error” (or undergraduate error 😉 ) I made in discussing the brightness of this galaxy with colleagues. But, more on my schoolboy undergraduate error next week; as I say today I just want to present the story. At a redshift of 11.09 +0.08 and -0.12 (pretty small errors), this galaxy is being seen when the Universe was only some 400 million years old, or to put it another way we are seeing it some 13.3 billion years ago! Truly remarkable. At number 24 in Rolling Stone Magazine’s list of the 100 greatest Beatles songs is their 1968 song “Happiness Is a Warm Gun”. This John Lennon composition appears as the 8th (and last) track on the first side of the double album The Beatles (usually known as The White Album). 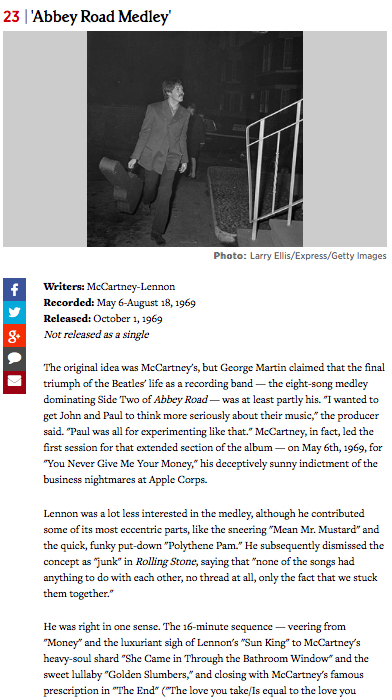 According to Lennon, the song was partly inspired (see below) by the cover of a gun magazine which producer George Martin showed him. Apparently the song is a fusion of three separate songs. The first was a series of visual images which Lennon had when on an acid trip with Derek Taylor, Neil Aspinall and Pete Shotton (a childhood friend from Liverpool). Lennon wanted to describe a girl who was really sharp, so Taylor suggested the line “she’s not a girl who misses much”. The second song fragment was some lines about Yoko, whom Lennon would often call “mother”. Finally, the third fragment of song was based on his seeing the cover of American Rifleman, the magazine of the National Rifle Association (NRA), where a single feature by a write named Warren W. Herlihy was entitled “Happiness Is A Warm Gun”. “Happiness Is a Warm Gun” was recorded in September of 1968, and appeared when The White Album was released in November of the same year. It is, apparently, both Paul McCartney’s favourite song on the album, and was also George Harrison’s favourite. Because of supposed sexual references, the song was originally banned from being played on BBC radio. 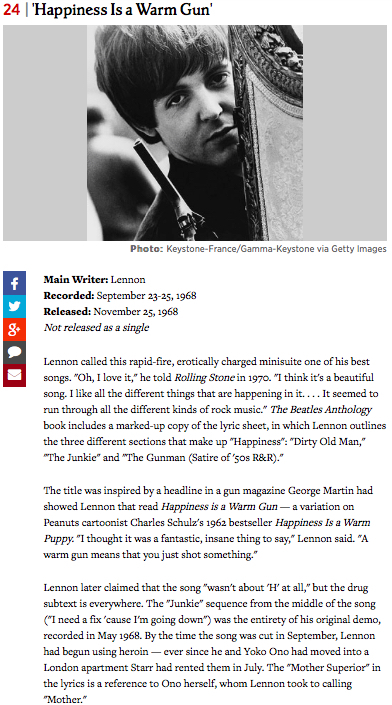 At number 24 in Rolling Stone Magazine’s list of the 100 greatest Beatles songs is “Happiness Is a Warm Gun”. Unfortunately I have not been able to find a video of this song anywhere. If anyone is aware of one please let me know in the comments section below, but it looks like all copies have been removed due to copyright infringement. But, as of Christmas Eve 2015, The Beatles’ music is now available on various streaming services, so if you have not heard this fantastic song you can now do so via one of those.